There's no greater find than discovering the person God created you to be! Take the quizzes . . . What would you do? What are you like? ^Young girls will have fun using this interactive guide to get a whole new view of themselves. 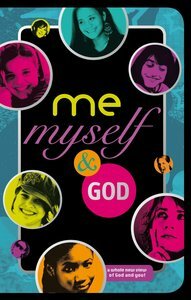 Complete with engaging questions and quizzes in a colorful format that's cool enough to be a fashion accessory,Me, Myself, and God offers an entertaining way for young girls not only to learn more about themselves, but also to learn more about God. This unique format includes a separate pull-out journal. ^^Once completed, the book become a keepsake that girls will enjoy looking back on as they continue to develop into the person God created them to be. About "Me Myself and God"
Claire Page is a multi-talented author of children's books, many of which she has co-authored with her husband, Nick. Claire and Nick have three daughters and live in Eynsham in Oxfordshire, England.